Basic Science in the Undergraduate Medical Curriculum. How much and how? I provide this not because his findings are directly relevant to us today, but to make the point that the issue of how much science is needed or appropriate for the study of clinical medicine has been contentious since the beginning of formal medical education. In his transformative review and 1910 report on the status of North American medical schools, Abraham Flexner strongly supports a scientific basis of medical education. In his second chapter “The Proper Basis of Medical Education”, he makes a strong case that, in order to provide optimal care and engage future developments, a physician must have a deep understanding of the scientific underpinnings of human function in health and disease. Flexner goes on to say that those entering medical school must have a “competent knowledge” of the “fundamental sciences” of chemistry, biology and physics, so that the clinical sciences of anatomy, physiology, pathology, bacteriology and “physiological chemistry” can be engaged in medical school. Flexner’s influence on medical education in the 20th century cannot be overstated. The fundamental model of basic science prerequisites to admission, followed by first and second year courses in anatomy, physiology, biochemistry, microbiology, pathology and pharmacology became standard, and the basis for accreditation standards. 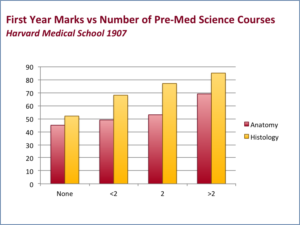 Medical students took courses and labs in these subjects that were very similar to those taken by undergraduates taking degrees in those subjects, sometimes even in combined classes. A very practical need to be selective with respect to curricular content, given the tremendous expansion of material to be taught. The development of new areas of science that are highly relevant to practice and must now also be taught, such as immunology, genetics and advanced imaging. The desire to take advantage of more effective teaching methodologies, recognizing that the lecture format is limited as a means of promoting individual understanding, and that traditional laboratory experiments are both logistically impractical and of limited relevance to those learning clinical applications. Medical schools have therefore been very much challenged with two key issues of what basic science should they teach and, critically, how should it be taught? At Queen’s, we re-organized our basic science teaching at the time of last major curricular revision in 2008. The Foundations Curriculum developed at that time included two consolidated first year Scientific Foundations courses, Normal Human Structure and Normal Human Function. This came at a time when our basic science departments were amalgamating into a single consolidated Department of Biomedical and Molecular Sciences which, under the leadership of Department Head Dr. Michael Adams, took on the directorship of these courses. Last year, in an effort to integrate the courses both with each other and with the other courses running in the same terms (particularly Clinical Skills) and our Facilitated Small Group Learning curriculum, it was decided to amalgamate the two into a single Human Structure and Function course that would run through the entire first year. This past week, I met with Course Director Dr. Chris Ward, Year 1 Director Dr. Michelle Gibson, and Dr. Adams to discuss our approach to next year’s course. We recognized that there is a wonderful opportunity here to better link it not only to contemporaneous courses, but also to those clinical courses that will follow in subsequent terms and years. We’ll therefore be putting out a call to invite clinical teaching faculty to provide input as to basic science content they feel would facilitate teaching in their courses and would better prepare students to engage the teaching of clinical presentations. In fact, we invite all faculty to share their views regarding the nature of basic science that is now relevant to clinical practice and their perspectives as to when and how that science should be introduced. We also welcome opportunities for clinicians and pathologists to participate in the basic science teaching in first year in partnership with our basic science instructors. This type of cooperative teaching is not only highly effective but models the collaborative practice that we wish our students to emulate. So, whether you share Dr. Huxley’s perspective above or not, we’d love to hear from you. 4 thoughts on "Basic Science in the Undergraduate Medical Curriculum. How much and how?" TIME for Translational Medicine at Queen’s University: A road map from Molecules to Populations (http://deptmed.queensu.ca/blog/?p=1635). While our new grad program (led by Dr James) is targeted at non-MDs, perhaps some of our Medical students could enroll? Queen’s needs ot get more science in the curriculum! Agree Stephen. Be happy to explore the concept of student involvement in TIME. Let’s discuss further. Thanks for raising this important issue in your blog, Tony. My own specialty of pathology is currently faced with an unprecedented opportunity to exploit the recent, explosive growth in humanity’s insight into the molecular underpinnings of disease to develop better diagnostics for the benefit of patients. Especially given the excitement of many of us in the field, the persistently and exceptionally low popularity of pathology as a career choice among our medical graduates is a source of wonder and dismay for me. Research from other medical schools has suggested that medical students do not so much reject a career in pathology as fail to consider it. Pathology achieves its greatest prominence in our undergraduate curriculum during the Mechanisms of Disease course, in which it is presented more as a basic science than a viable medical specialty. I respectfully suggest that a dedicated effort to identify new opportunities for students to engage with pathology and pathologists as they make their way through our curriculum will benefit both students and patients. Students will be able to make informed career choices and patients will ultimately benefit from accurate, timely testing developed and implemented by our wonderful graduates. Thanks David. Couldn’t agree more on the importance of Pathology both as a key component of the fact that it has not always been well presented to the students as a career option. I think we’ve made some progress on both fronts over the past few years, thanks to the efforts of you and your colleagues, and remain open to further involvement and suggestions regarding how we can improve in both regards.